…we are veterans of war! – Tony Borie – "Pieces of my life"
…we are veterans of war! …somos veteranos de guerra!. (we are veterans of war)!. …quando, numa manhã fria de Janeiro do ano de 1965, foram dadas ordens a um Esquadrão de Caças F-105 da Base Americana de Okinawa, no Japão, para que se transferisse para a Base Aérea de Da Nang, no Vietname do Sul, para dar cobertura ao Corpo de Marines, que tinham por missão cruzar o Paralelo 17, que era uma linha de demarcação militar provisória e desmilitarizada entre o Vietname do Norte e o Vietname do Sul, estabelecida na Conferência de Genebra de 1954, que pôs fim à Guerra da Indochina, embora não coincidindo com o verdadeiro paralelo, pois no terreno era uma região um pouco a sul ao longo do rio Ben Hai, na província de Quang Tri, até à vila de Bo Ho Su e dali para oeste até à fronteira entre o Vietname e o Laos, foi quase o mesmo quando anos antes o responsável pelo então governo de Portugal disse em frente às câmaras de televisão, referindo-se ao então ultramar que, “vamos para a guerra e em força”. (when on a cold January morning of 1965, were given orders to a Fighter Squadron F-105 of the American Base in Okinawa, Japan, to whichtransfer to the Air Base of Da Nang in South Vietnam, to cover the Marine Corps, who had the taskcrossing the Parallel 17, which was a line of temporary and demilitarized military demarcation between North Vietnam and South Vietnam, established in the Geneva Conference of 1954, which ended the Indochina war, though not coinciding with true parallel because the field was an area just south along the river Ben Hai, in the province of Quang Tri, to the village of Bo Ho Su and thence west to the border Vietnam and Laos, was almost the same as years before then responsible for the government of Portugal said in front of the television cameras, referring to the then overseas that “we go to war and force”)!. …quando no dia seguinte, 49 destes caças levantaram voo da base de Da Nang, para atacar alvos do Vietname do Norte, fazendo com que a partir desse dia a guerra não ficasse mais restrita ao território do Vietname do Sul e, o primeiro desembarque de 3500 soldados americanos em Março, naquele território, já se havia transformado em 200 mil, em Dezembro do mesmo ano e, quando em 1973, as tropas americanas se retiraram do conflito, havia cerca de 58 mil soldados americanos mortos, contudo o conflito prosseguiu com a luta armada entre o Norte e Sul do Vietname, que ficou dividido, terminando em absoluto em 1975, com a invasão e ocupação de Saigon, então a capital do Vietname do Sul e a rendição total do exército sul-vietnamita, foi quase o mesmo quando os militares de Portugal, um ano antes, se revoltaram e destituíram o então governo de Portugal, ficando para trás um número de mortos, nas então províncias ultramarinas, que nós pelo menos não sabemos exactamente, mas devia andar pelas dezenas de milhar, talvez milhões, nas populações que foram ou viriam a ser afectadas pelo conflito, que infelizmente foi armado!. (When the next day, 49 of these fighters took off from the base of Da Nang, to attack targets from North Vietnam, causing from that day the war would not be more restricted to the territory of South Vietnam and the first landing of 3500 American soldiers in March that territory, had already been transformed into 200 000 in December of the same year, and when in 1973, US troops withdrew from the conflict, there were about 58,000 American soldiers dead, but the conflict continued with the armed struggle between North and South Vietnam, which was split, finishing at all in 1975 with the invasion and occupation of Saigon, then South Vietnam capital and total surrender of the South Vietnamese army, was almost the same when the military of Portugal, a year earlier, revolted and ousted the then government of Portugal, left behind a number of dead in the overseas provinces so that we at least do not know exactly, but devi walking by the tens of thousands, perhaps millions, in populations that were or were to be affected by the conflict, which unfortunately was armed)!. …quando terminou o conflito, no caso do Vietname, os números não eram precisos, mas oscilam entre milhão e meio a dois milhões de vietnamitas mortos, entre civis e militares, onde parte considerável desta população era economicamente activa, que morreu durante o conflito e, como se compreende, este facto provocou uma grave crise económica nos anos seguintes ao seu final, além dos talvez milhões de pessoas, oriundas do Camboja e do Laos, que foram arrastados para a guerra com a propagação deste mesmo conflito. (When finished the conflict, in the case of Vietnam, the figures were not accurate, but oscillate betweenmillion andhalf to two million Vietnamese dead, civilians and military, whereconsiderable part of this population was economically active, who died during the conflict, as we understand, this has caused a serious economic crisis in the years following its end, beyond perhaps millions of people, coming from Cambodia and Laos, which have been dragged into the war with the spread of that conflict)!. …comparações com a guerra que vivemos em África? Os números são gigantes, nós chamávamos aos guerrilheiros “Turras”, os americanos chamavam “Vietcongs”. Este termo, abreviado para “VC”, deu origem ao termo utilizando a fonética militar de “Victor-Charlie” de onde surgiu o nome “Charlie”, também como apelido aos guerrilheiros, tirando isto talvez houvesse mais coincidências: na data, no combate e contacto com o inimigo nas selvas húmidas e pântanos da Guiné, mas em cenário de guerra não há lá muita comparação, nós lutávamos com um infinito de dificuldades, tanto em material logístico, como em alimentação, alojamento, assistência médica, evacuação de feridos e mortos em combate, tal como outros motivos de sobrevivência. Valia-nos, entre outras coisas, um pouco de audácia, coragem e improviso, em que éramos e continuamos a ser, pelo menos os que nasceram nos anos quarenta ou cinquenta do século passado, alguns com a instrução escolar mínima, um pouco melhor que a média, talvez por sermos descendentes de diversos povos que em tempos habitaram a Península Ibérica, que eram sobretudo guerreiros por natureza!. (Comparisons with the war we live in Africa? The numbers are giants, we called the guerrillas “gooks,” the Americans called “Vietcong.” This term, abbreviated to “VC”, gave rise to the term using the military phonetic “Victor-Charlie” where the name “Charlie” came also as a nickname to the guerrillas, taking it there might be more coincidences: the date in the fight and contact with the enemy in the humid jungles and swamps of Guinea, but at war scenario there is not much comparison there, we were fighting with an infinite difficulties, both in logistical material, as in food, housing, medical care, evacuation of wounded and killed in combat, like other survival reasons. Valia us, among other things, a little audacity, courage and improvisation, in which were and continue to be, at least those who were born in the forties or fifties of the last century, some with minimal schooling, a little better than the average, perhaps because we are descendants of various peoples who once inhabited the Iberian Peninsula, which were mainly warriors by nature)!. …nós aprendemos depressa que aquela era uma guerra que só poderia ter um fim político e não de luta armada, onde uma faca, por vezes era a melhor arma de combate e, a pior, no nosso modesto entender, era um avião. Enquanto os soldados americanos se armaram de grande poder de fogo, em artilharia e aviação de combate para destruir as bases inimigas e impedir as suas ofensivas, pois no terreno praticavam acções defensivas, deixavam a acção ofensiva para os F-105 e helicópteros armados, embora eles fossem treinados e instruídos para guerras ofensivas, os seus comandantes eram psicológica e institucionalmente pouco qualificados para essas acções defensivas, no entanto nós éramos treinados para lutar e ir ao encontro do inimigo, fazer aquelas incursões no terreno, diárias, ir ao encontro, não importava se a zona era perigosa e base de inimigos, nós tínhamos que caminhar por lá, calcar minas e fornilhos mortais, onde o inimigo usava os segredos daquela selva e daqueles pântanos em seu favor, onde havia a necessidade de beber a para nós, “célebre água da bolanha”, motivo por que hoje começam a aparecer sinais de doença, como por exemplo, entre outras, o cancro, de que não se sabe a origem. (We learned quickly that this was a war that could only have a political purpose, not armed struggle, where a knife sometimes was the best melee weapon and the worst, in our modest opinion, it was an airplane. While American soldiers are armed with great firepower, artillery and aviation combat to destroy enemy bases and prevent their offensive because the ground practiced defensive stocks, leaving the offensive action for the F-105 and helicopter gunships, though they were trained and instructed to offensive wars, their commanders were psychologically and institutionally poorly qualified for these defensive actions, however we were trained to fight and go to meet the enemy, do those incursions on the ground daily, to meet, not matter if the area was dangerous and base enemies, we had to walk there, trample mines and deadly bowls, where the enemy wore the secrets of that jungle and those marshes in their favor, where there was a need to drink for us, ” famous water bolanha “why now begin to show signs of illness, such as, among others, cancer, not s and know the origin)!. …quando o Jack, que nasceu no estado do Wyoming, depois de fazer dois “tours” de seis meses cada à guerra do Vietname, regressou ao continente americano, continuou no Corpo de Marines, seguindo a carreira militar, pois as suas possibilidades de sobrevivência nas planícies do Wyoming eram montar um cavalo durante todo o dia, guardando manadas de vacas ou cavalos, comendo carne de algum animal que tivesse que ser abatido, carne essa que podia ser consumida assada ou seca e curada, para ser comida crua durante sete dias por semana, tal como o nosso sargento da messe, lá no aquartelamento de Mansoa, que era oriundo das planícies do Alentejo. (When Jack, who was born in the state of Wyoming, after making two “tours” of six months each to the Vietnam War, he returned to the American continent, continued in the Marine Corps, following the military career because their chances of survival in Wyoming plains were riding a horse throughout the day, keeping herds of cows or horses, eat any animal meat which have to be slaughtered meat that which could be consumed baked or dried and cured, to be raw food seven days a week, as our sergeant of the harvest, there in the barracks of Mansoa, which was from the plains of the Alentejo)!. …quando o Smith, soldado do Alabama, que foi ferido em combate e transferido para o hospital militar de Saigon, hoje se faz transportar numa cadeira de rodas, se orgulha de ser combatente dizendo alto e bom som que não se queixa do destino, pois criou a sua família e sempre foi ajudado pelo governo, que lhe proporcionou algum conforto no meio da sua vida de pessoa com alguma desvantagem. Ou mesmo o John, soldado ferido em combate, a quem posteriormente foi amputado um membro superior, não quer qualquer ajuda, mudando ele mesmo a roda do seu carro, tal como qualquer João, José ou Manuel, companheiros feridos nas savanas da Guiné. (When Smith, soldier Alabama, who was wounded in combat and transferred to the military hospital in Saigon, now it does carry a wheelchair, is proud to be fighting saying loud and clear that he does not complain of fate, it created his family and was always helped by the government, which gave him some comfort in the middle of a person’s life with some disadvantage. Or even John, soldier wounded in combat, who was later amputated a senior member, does not want any help, changing himself the wheel of your car, like any John or José Manuel wounded comrades in Guinean savannas)!. …tudo isto vem a propósito de que os soldados americanos regressados dessa guerra, e nós somos testemunhas privilegiadas devido à nossa posição, quando em actividade de oficial da United Steelworkers, que é hoje o maior sindicato de trabalhadores de metalúrgica nos Estados Unidos, porque convivemos durante anos com alguns destes militares, por vezes mediando conflitos, que embora tivessem pouca instrução escolar e estivessem um pouco traumatizados, foram sempre encorajados na procura de trabalho, na compra de casa e outros bens. Existe mesmo um Banco dos Veteranos que lhes facilita empréstimos para compra de habitação ou qualquer outro investimento. Foram sempre preferidos e respeitados, por vezes bastava-lhes dizer que eram veteranos, que quase todas as portas se abriam, claro, havia excepções como em tudo na vida, mas os ainda sobreviventes da guerra do Vietname têm assistência. Existem os Hospitais dos Veteranos, localizados nas principais cidades de quase todos os estados, têm ajudas relativas em algum caso de necessidade extrema e, acima de tudo, orgulham-se do seu passado de combatentes. 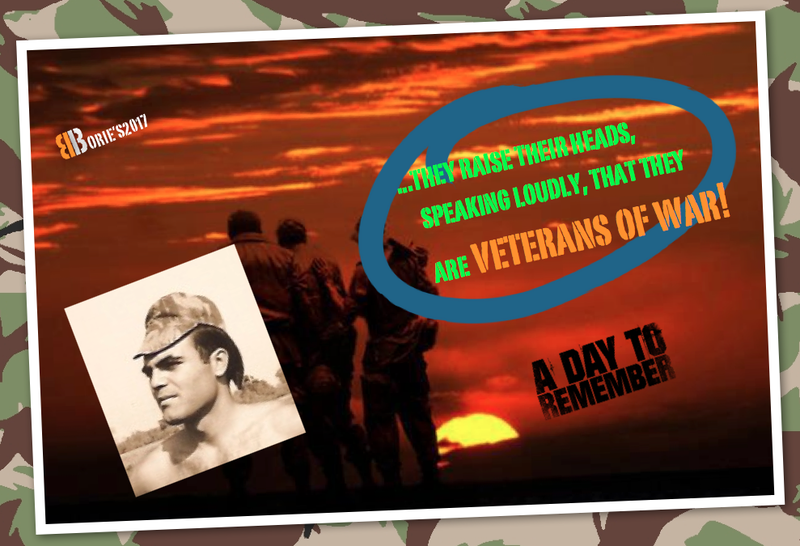 Quando começamos qualquer conversa, as primeiras palavras deles são para dizer que não querem nem ouvir a palavra, “Vietnam Syndrome”, levantam a cabeça e dizem bem alto que são veteranos de guerra!. (All this comes the purpose of American soldiers returning from this war, and we are privileged witnesses due to our position as an official activity of the United Steelworkers, which is the largest union of metal workers in the United States because we live for years with some of these military sometimes mediating conflicts, that although they had little schooling and were a little traumatized, have always encouraged the search for work, buying house and other assets. There is even a Bank of Veterans who makes them loans to purchase housing or any other investment. Have always preferred and respected, sometimes it was enough for them to say they were veterans, that almost all the doors opened, of course, there were exceptions as in everything in life, but also survivors of the Vietnam war have assistance. There are the Veterans Hospitals, located in major cities of almost all states have aids for in a case of extreme necessity and, above all, they pride themselves of their past fighters. When we begin any conversation, the first of these words is to say that not even want to hear the word “Vietnam Syndrome” raise their heads and say loudly that are war veterans)!. This entry was tagged veterans war stories. Bookmark the permalink.